Punishment is a topic of increasing importance for citizens and policymakers. Why should we punish criminals? Which theory of punishment is most compelling? Is the death penalty ever justified? These questions and many others are addressed in this highly engaging guide. 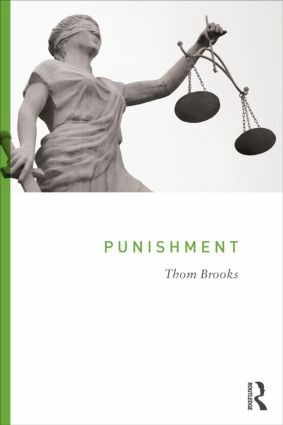 Punishment is a critical introduction to the philosophy of punishment, offering a new and refreshing approach that will benefit readers of all backgrounds and interests. The first critical guide to examine all leading contemporary theories of punishment, this book explores – among others – the communicative theory of punishment, restorative justice, and the unified theory of punishment. Thom Brooks examines several case studies in detail, including capital punishment, juvenile offending, and domestic abuse. Punishment highlights the problems and prospects of different approaches in order to argue for a more pluralistic and compelling perspective that is novel and groundbreaking. Punishment is a textbook designed to introduce both undergraduate and postgraduate students to the topic of punishment. It will be essential for undergraduate students in: philosophy, criminal justice, criminology, justice studies, law, politics, and sociology.